I'm Emma and am a qualified DSA Approved Driving Instructor. 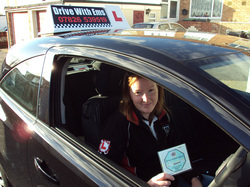 "Drive With Ems" was formed by myself, as a fully independent driving school in 2010. I am based in Gosport, but willing to travel to surrounding areas. I can collect you from home, work or college. Whatever is easier for you. I want nothing more than to help others achieve what I consider a life changing skill...learning to drive. I will never forget the day that I passed my driving test at the age of 18. Being able to drive my pride and joy on my own. It gives you a real sense of freedom. Cars in general have played a huge part in my life, from learning new skills to making some great friends. I have been a member of a local Mini Owners Club since 2001, and have worked in the motor trade since 2003. Firstly as a mechanic and then as a service advisor, both in main dealers. All this has helped me to become the person I am today. My chosen car for driving instruction is the 2016 Suzuki Swift 1.2 Dualjet, which is a very nice car to drive. I offer one-to-one driving lessons in and around the Fareham area and including postcodes PO12 to PO15. I aim to make learning to drive an enjoyable experience, in a calm and relaxed environment. I feel that you can learn better that way. It doesn't matter if you've had a few lessons before, or are a complete novice. We will take it all step-by-step and practice will make perfect. Safe driving for life is the main aim!